Recently, I was fortunate enough to be booked at the South Shire Inn following an event in Bennington, Vermont. Having checked out the inn’s website weeks before my stay, it seemed like the perfect opportunity to take my grandmother along for a bit of a girl’s weekend. Designed by William C. Bull, this beautiful 1887 Victorian inn was originally owned by Louis A. Graves. 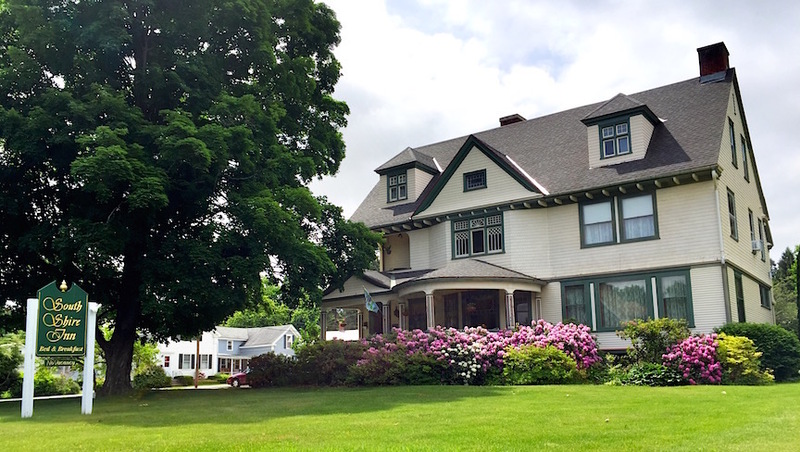 Located at 124 Elm St. in Bennington, Vermont, the home was beautifully renovated and lovingly looked after by it’s current owners and caretakers. Walking through the front door into the lobby, I honestly fell in love. From the wooden dutch door, oval windows, wall paper, window seats, antique furniture and reception desk my grandmother and I felt like we stepped back in time. While we stood in the lobby admiring the over all charm of the place we were greeted by the owner. When the event manager put me up in this location, I never told him I was bringing my grandmother. However, when I was sent the booking confirmation it stated it was booked for two guests-which is pretty standard in most accommodations even if there is only one guest checking in. Having stayed in so many hotels, I hadn’t thought much of letting the inn or the event manager know I would be bringing a guest with me. I just figured it would be fine, forgetting the fact inn’s are a bit different than an impersonal hotel with 50 rooms. Inns tend to be more one on one with their guests, more personable and tend to include breakfast. Rather than get cranky about the fact I slipped up, the owner was very sweet. She simply stated, “Oh, there are two of you! …the bed is kind of small…” and then went on to apologize about the stairs. While the staircase is absolutely beautiful, I will say if you have a hard time climbing stairs it would be smart to book a room on the first floor. While grandma did get up and down them OK… being 91, a room on the first floor would have been a smarter option. Regardless… as you can see, the room was warm, comfortable and decorated for the time period. My grandmother and I spent a good amount of time admiring the ornate details in the wood and metal work on both the bed and bedside tables. Once you have a look at the wall paper in the room, it’s pretty obvious why the room is called the Peach Room. The color wasn’t overwhelming at all though… the light carpet, white curtains, ceiling and trim balanced the color well giving the room a clean, crisp, bright and cozy feel. The bed… while it was small in size (full), my grandmother and I fit on it just fine. The mattress wasn’t bad, firm but comfortable. I tend to like mattresses that are like pillows (even though my back hates them) but it really is a matter of preference. Overall, neither of us had any complaints. That’s right-stay in the Peach Room at the South Shire Inn and you too can bunk with E.T.! The bathroom was large, bright and clean with plenty of storage and closet space. Looking at the bathroom’s layout, it was obvious that it was once a small bedroom converted into a bathroom. There was one detail in the bathroom that had my grandmother and I laughing… check out the window near the toilet and the white wicker bench. Notice it is literally floor level? From what the Inn owner told me, this was a typical feature of Queen Anne style homes. Windows were placed where they looked good on the outside of the home… but that didn’t always mean their placement in the house made sense. It definitely added a bit of character to the room… however, keep in mind-this room is on the second floor. If the window shade is up, you have an amazing view down of the parking lot… from the toilet. Which also means… for any unlucky guest who just happens to look up from the parking lot-there you are in all your glory sitting on your peach room throne! While slightly hilarious, closing the shade is a good idea. One of the things that was repeated over and over again in the guestbook was the “delicious” breakfast, so of course grandma and I couldn’t leave without giving it a go! We made our way down for breakfast about a half hour before it ended which was nice because the room wasn’t loud or crowded. In fact, we were just getting seated as everyone else was leaving. “This definitely wasn’t a Williams’ house…” Grandma said joking, noting that not everyone lived in homes like this in the 1880’s. That’s when the owner mentioned the home was owned by a family of bankers. While the main part of the house was built in 1887, an addition was added in the early 1900’s by the same family which included the breakfast room and the equally impressive library. It was as delicious as all the previous guests had stated in the guestbook. Breakfast started with a fruit plate of melon and strawberries along with buttermilk poppy seed coffee cake and your choice of coffee or juice. The poppy coffee cake was ridiculously good… and luckily it didn’t keep me from passing my work related drug test three days later. Next up was a broccoli, cheddar quiche with sausage and a choice of toast. We had zero complaints with breakfast-left full and happy! Overall, the owners of the South Shire Inn were helpful, friendly and accommodating. The Peach Room was spacious, beautifully decorated, comfortable and included a large bathroom. The guestbook didn’t lie-breakfast was delicious and the inn’s location was central to a lot of Bennington’s attractions and sites (many of which were in walking distance). In my opinion, the South Shire Inn provides an enjoyable step back into the past with all the modern conveniences. It’s a great place to book if you are looking for a romantic getaway or a girls weekend in southern Vermont! LOVE the bed in the Peach room. It’s amazing !!! Looks like a nice place. You should-surrounded by a cute lil New England town too! What a nice place Kris, I like old places like this. I never have been to a bed and breakfast before,I like that peach room. And that second floor bathroom with the beautiful view, that’s to funny kris, and there you are in all your Glory sitting on your peach room throne. LOL Yes I agree, I think I would wanna keep that shade pulled down while taking care of business. Thanks for sharing Kris, Love it! !! !